Largest crowd to ever watch live hockey game witnesses shootout. ANN ARBOR, Mich. (AP) — A lot of winter. Very little classic hockey. 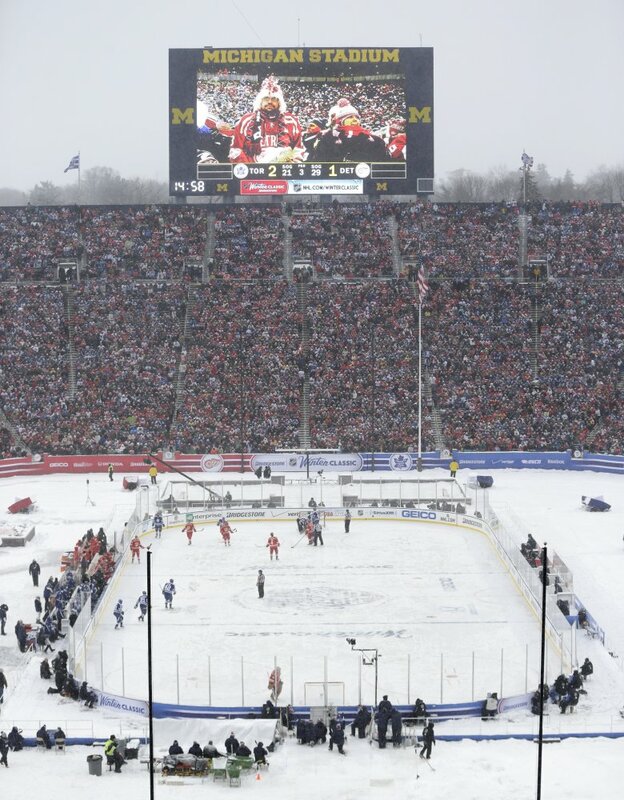 Tyler Bozak scored the winning shootout goal and Jonathan Bernier made two saves in the heart-pounding final moments, lifting the Toronto Maple Leafs to a 3-2 victory over Detroit at the snowy Winter Classic in front of the largest crowd to watch a hockey game. The announced attendance Wednesday of 105,591 surpassed the 104,173 who saw Michigan and Michigan State skate in the same football stadium known as the Big House in 2010. The game began with temperatures in the low teens and steady snow that didn’t stop on a windy afternoon, leading to the sixth Winter Classic being much more of an event than a game. It was, though, a closely contested spectacle. Detroit captain Henrik Zetterberg appeared to have good chance in overtime with the puck in the Maple Leafs’ end and defenseman Cody Franson on his left side. The horn, however, sounded to stop play at the 2:30 mark of the extra period so that both teams played into a 10 mph wind for an equal amount of time. The game also was halted midway through the third period so that the teams could switch sides. In the shootout, skaters for both teams attempted shots with the wind in their face toward the same net — or end zone. The game-time temperate was 13 degrees with a wind chill of zero. The average temperature of the previous five Winter Classics was 39 degrees, and the average attendance was 53,045. A slew of skaters with shovels cleared significant amounts of snow during early stoppages in play, but players still had a tough time pushing the puck through piles of the white stuff. The struggling yet storied franchises did their best to put on show in the league’s annual showcase in awful conditions. Joffrey Lupul, who might face discipline from the NHL for a cross-check that knocked Patrick Eaves out of the game in the first period, scored the first of two goals for the Maple Leafs in the shootout. Pavel Datsyuk scored Detroit’s only goal in the shootout and teammate Tomas Tatar was foiled on his team’s third attempt because he struggled to control the puck on the snow-covered surface and didn’t even get a shot off. Bernier, with a knit hat over his helmet, made 41 saves. Jimmy Howard had 24 saves for Detroit. After leaving the ice and the snow-covered football field, he returned minutes later when he was introduced as one of the members of the U.S. Olympic team that will go for gold next month in Sochi. Detroit’s Justin Abdelkader tied it 2 with 5:32 left in regulation after Bozak scored the go-ahead goal early in the third period. Daniel Alfredsson opened the scoring for the Red Wings at 13:14 of the second and James van Riemsdyk tied in on a power play with 37 seconds left in the period.